Thanks to a group of volunteers from United Way of Southwestern Indiana #DayOfCaring on Sept. 9th we completed a survey of 100 people with a #ReadForLife theme. The first question tells us that we have work to do to make sure people know where to send someone if they need help with reading. Thanks to Dollar General Stores for allowing us to survey their customers! 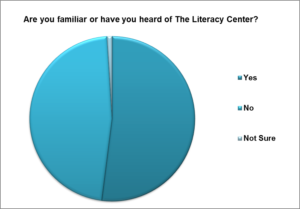 36% would go to the library first but only 6% knew to come to The Literacy Center. We want to build better collaborations with EVSC, United Way, Carver Community Center, and colleges. We are the adult education center that those who struggle with reading can go to for help. 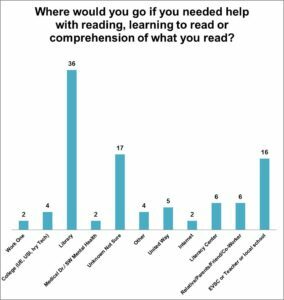 52 had heard of the Literacy Center but yet they don’t know what we do? The Literacy Center is dedicated to improving basic adult literacy in our community. 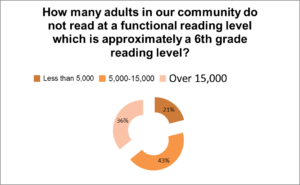 It’s not surprising that 97% feel that is is extremely important for every adult in our community to have the ability to read. 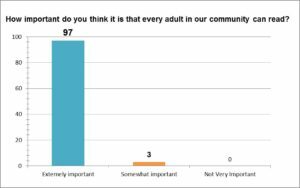 43% were correct- it is approximately 18,000 adults who struggle in our community alone! Over 30 million in the USA. 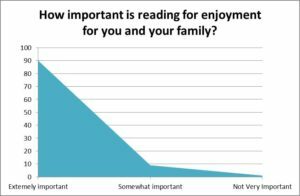 90 % agree is is extremely important to read for enjoyment, we must model if we want our future (children) to be good readers. Reading is vital to developing communication, making connections and critical thinking skills. Please help us by sharing our information. We want Read For Life to mean just that – you Read to Be Better at Life.